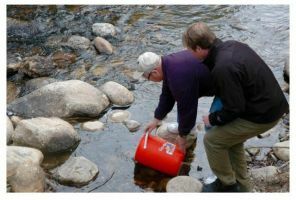 On April 16 and April 21, for the first time in over 20 years, hatchery kokanee were released back into Penticton Creek. Volunteers from the Penticton Flyfishers Club released just over 45,000 kokanee fry reared in the club’s small hatchery trailer. This represents the culmination of seven months of work by their dedicated volunteers, as well as technical support from the Freshwater Fisheries Society of BC. Everyone involved hopes that, ultimately, the creek will once again support significant and self-sustaining populations of rainbow trout as well as kokanee. Land-use practices associated with agriculture, urbanization, and flood control works have severely degraded many tributaries of Okanagan Lake that once supported spawning rainbow trout and kokanee. 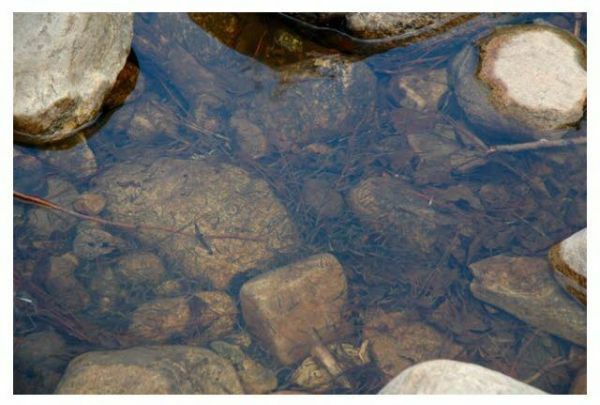 At one time, Penticton Creek was a very important spawning tributary, but currently provides little known fish habitat because much of its length is lined with concrete – and impassable to fish. The Penticton Creek Restoration Committee is working to bring back some of the stream’s lost habitat. Re-starting the Penticton Flyfishers’ hatchery will play a key role as part of this larger restoration initiative by rearing juvenile fish that can return to spawn in the reclaimed habitat beginning in the fall of 2018.